Seawater cooling system for Prestfjord trawler. Gondan Shipyard in Spain has awarded Hydroniq Coolers a contract to deliver a seawater cooling system to a state-of-the-art trawler the yard is building for Norwegian fishing company Prestfjord AS. Norwegian technology company Hydroniq Coolers – formerly named Sperre Coolers – will deliver its Hydroniq Rack seawater cooling system for the machinery on board. Marine cooling systems are utilised to reduce temperatures in the ships’ engines and other auxiliary systems through use of seawater. “We have delivered our Rack marine cooling system to several trawlers already. It is a really good solution for fishing vessels that generally do not have a huge amount of available space on board,” says Inge Bøen, CEO of Hydroniq Coolers. Hydroniq Coolers will deliver its marine cooling solution during the first quarter of 2019. The contract value is undisclosed. 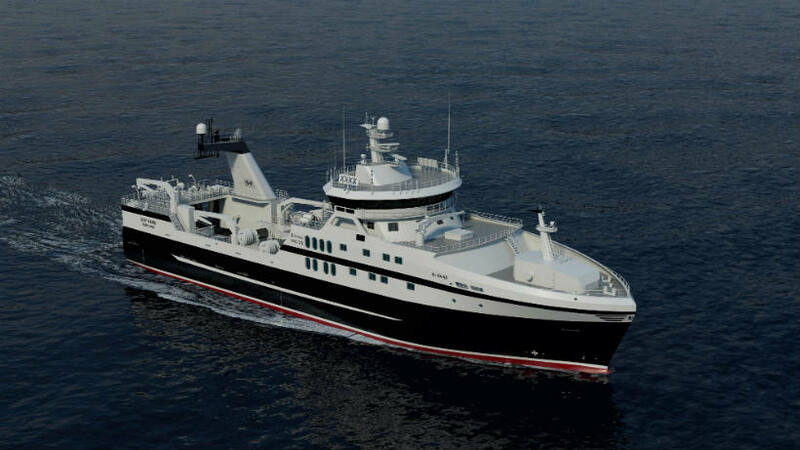 The new trawler, which is scheduled for delivery in 2020, will be built to a NVC372 design and is arranged for pelagic and demersal trawling in Arctic waters, and will operate on both whitefish and shrimp. The trawler will be approximately 77 metres long and can accommodate a crew of 29. The trawler will be equipped with a battery system that regulates load changes and is integrated with the hybrid propulsion system. Central to the system is Hybrid Shaft Generator (HSG), which contributes to reduced emissions. This means that the trawler can switch between operating diesel-electric, diesel-mechanical or with a combination of both. “This is a highly modern trawler that is packed with innovative solutions that are tailored to optimise its energy consumption. Our Rack system is therefore a perfect match for the vessel. Because it is the market’s most energy efficient and maintenance friendly marine cooling solutions,” says Inge Bøen. The Hydroniq Rack seawater cooler offers several operational and economic advantages compared with traditional plate heat exchangers. The system provides a simplified and short pipeline for seawater and has very low back pressure which reduces energy consumption for seawater pumps and thus lower fuel consumption. “We are committed to ensuring that our fleet is as efficient as possible, with regards to both the environment and for fishing. At the same time, we only choose technological solutions that can offer us savings on operational costs. That is why we have gone for a Rack solution from Hydroniq Coolers,” says Knut Roald Holmøy, managing director of Prestfjord AS. Hydroniq Coolers delivers marine cooling solutions to vessels that operate within offshore, shipping, cruise, passenger transport, fishery and fish farming. Shipowners, yards and ship designers are among the company’s customers and cooperation partners. The company is owned by Norwegian investment company SMV Invest AS (formerly Sperre Mek. Verksted AS. Fish Focus is an online communications, marketing, news and information platform offering a wide range of services for the seafood sector covering all aspects of aquaculture, commercial fishing, seafood processing and the route to market. Follow us on social media platforms for Fish Focus, Aquaculture Focus and Seafood Focus.